Situated on South Pattaya Road, Signature Pattaya is just a 10 minute walk from the buzzing Walking Street. Drive for around 45 minutes to access the property from U-Tapao Rayong-Pataya International Airport. Area's popular tourist hotspots, such as the Ripley's Believe It or not Museum and CentralFestival Pattaya Beach Shopping Mall are within a 5 minute drive of the hotel, whereas the Art in Paradise Museum is around a 10 minute drive away. Ideal for a delightful stay, the hotel's 131 lavishly designed rooms and suites offer breathtaking views of the Gulf of Thailand and city's skyline. Amenities like air conditioning, flat-screen TV, telephone with voicemail facility, mini refrigerator, work desk and free Wi-Fi access are provided in all guest rooms. Begin the day on a healthy note with a rigorous workout session at the hotel's fully equipped fitness centre and further, take a refreshing dip in the outdoor pool. With a capacity to accommodate up to 150 people, the two state-of-the-art meeting rooms are apt for hosting a successful corporate event. In addition, conveniences like business centre, airport transfers (paid), local area shuttle, and complimentary parking and Wi-Fi access make for blissful stay. For a sumptuous meal, dine in the welcoming ambience of the hotel's all-day dining MoMo Cafe that serves toothsome international dishes. The hotel has an Indian chef and even serves Indian dishes for breakfast. ?The on-site MoMo Bar serves an extensive selection of beers, wines, whiskeys and cocktails. Saras, Raj and many other Indian restaurants are within 5 minutes from the property. The nearest McDonald's Restaurant is only a 15-minute walk from here. Known for its bustling nightlife, Walking Street is reachable in just 10 minutes by foot. 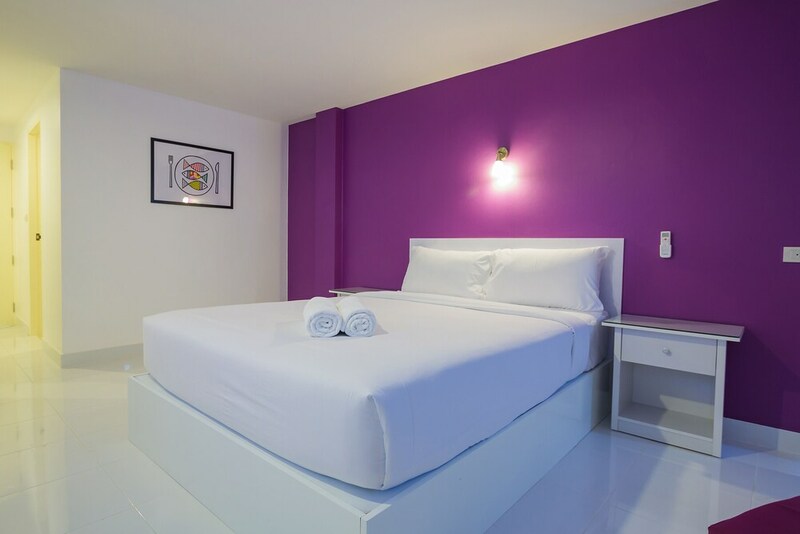 Can use an extra bed per night for THB 600. Good hotel and amenities. Staff also polite. Not good for family stay in that area. Nice room with good atmosphere. Food is good. Cistern and washbasin was not working properly. Good place and good food. Nice stay enjoyed the atmosphere. Apart from staff everything is good. Overall fine room for the money spent. It was nice experience staying at signature. Great location, lots of Indian restaurant near by. It was good experience, service was great, nice swimming pool and lot of Indian restaurants around. First of all, the Signature Pattaya name is now Courtyard Marriot and not Signature and it took lot of time for my taxi guy to search it. But once entered, everything was excellent about the Signature Pattaya except for food which was just average during breakfast but had many options. Hotel guy gave me a free upgrade to deluxe category room and also free breakfast which was initially not part of the room type. Hotel location is just 5 minutes walking distance from Walking street. The cleanliness and maintenance of the Signature Pattaya is similar to a 5 star. Even if you book taxis from Signature Pattaya, you get good deals and is convenient. Overall, highly satisfied with my 3 night stay. We had booked 2 rooms for 5 adults, 2 adults in 1 room and 3 in another. We were told that we would have to pay 1500 thb for the 3rd person even though we have pre-booked for 3 adults. Looks they charge extra for the mattress or else 3 adults have to adjust in the common bed. Apart from this the Signature Pattaya is neat clean and on pay with other Marriott across the globe. Staffs are friendly and also gave us bf box for the early morning flight. However on a leisure trip one can prefer other leisure Signature Pattayas rather than opting for a business Signature Pattaya like this. It is a very nice property on the South Side of Pattaya. Large comfortable rooms. Staff or very polite and helpful. Internet is fast and facilities within the property are great. The restaurant at the lobby serves some great Thai food(Did not try the Indian Food). If you travelling from Bangkok and not part of a tour it costs 300 Bahts to get from the Pattaya Bus Stand to the Signature Pattaya and around 500 Bahts from the Pattaya Airport. It is about a 30 min walk from the Walking street where all the action is. But a great place if you travelling with the family. Pleasant stay not crowded as other Signature Pattayas. Guest free Signature Pattaya, also having no complaint about other rooms. It's silence every one enjoy Pattaya nightlife without hesitation. Location is better near walking street you can walk easily. Lots of Indian restaurant nearby so if you book any room without breakfast no worry you can easily go any Indian restaurant just 2 min walk and have great breakfast in cheaper rate and good taste. I had stayed there with my friends to enjoy nightlife. For families no worry. My stay at courtyard Marriott, Pattayam was more than satisfying. The Signature Pattaya is located close to main road walking distance from any shopping centre and easy transportation. The management is cooperative to accommodate to our unforeseen needs. Morning breakfast is sumptuous and delicious. Every employee with his or her genuine smiling face and namaskaram in typical Thai style is a very welcoming gesture. Rooms are spacious and clean. What more we need for a small budget holiday??? The staffs are very courteous and good hospitality, brand matters. Momo cafe food was surprisingly very bad, even the breakfast. I am using Marriott groups of Signature Pattayas as a member since last 4 years, first time I found complementary breakfast is drawing a bill that require signature of the residents though bill was not charged but Signature while entering for breakfast. Swimming pool is very small and not dip enough with highly chlorinated water. Check in and check out was a breeze. Hardly took 2 minutes. The staff are very courteous and pleasant. Even during breakfast, they are always nearby enquiring if you need anything. Swimming pool is small but adequate. Buffet was good but veg spread can be increased. Rooms are neat and clean. Indian food menu also available. Will definitely stay if I visit Pattaya again and will also recommend. I think from my point of view, for me everything was up to the mark. I really enjoyed my vacations in Courtyard Marriott. Thanks a lot MakeMyTrip for making my holidays awesome love you, next time I will again gonna prefer MakeMyTrip for me to Bangkok and Singapore. Love you a lot again I do not have any words just because of MakeMyTrip I had awesome holidays which I have never thought. It is awesome place to stay as the Signature Pattaya is very good, neat and clean with big spacious room, and main thing is staff was really friendly and i did not felt as me in Signature Pattaya which do not like Indians, this Signature Pattaya is near walking street and I stayed in this Signature Pattaya for 5 days highly recommended. Hotel is very good. Nice locality and staff is also very nice and good behaviour but there is one problem with that Signature Pattaya is they not give complimentary breakfast when you book with any travel app even they not charge for WiFi and also they do not charge for girl you bring from disco. Atlast me giving 10 out of 10 marks. The location is little away from beach- walk of 15 mins, the Signature Pattaya pool is great, service was fast and excellent- though they gave room little late. The rooms are nice, big bathrooms. The amenities given in room are nice. Great value for money, Family mart is next door and good 3 Indian restaurants at 5 min walk. Little away from walking street. But true value for money in all aspects. Complimentary water was limited and even match box was charged to me. Good and very well maintained property and rooms are good. Nice swimming pool, friendly staff and overall good stay at the Signature Pattaya. We have not tried food at the Signature Pattaya to comment. Rooms are spacious with a good and well maintained bathtub. Overall excellent. More Choice of Indian Veg Food in Buffet Breakfast! Veg food spread was limited. Non- food spread seems to be good! Couldn't speak to chef for Veg Food! Very good Location! Staff very helpful! It was missing Marriott Touch! Very good room, near walking street. Good location. WiFi is very good speed. Hospitality is excellent. They were serving Indian food in breakfast and that was delicious. Hotel location is very good. It is near to walking street. Also you will get transportation easily. You can walk from Signature Pattaya to beach. Market area is also nearby. Overall it was nice to stay here. This is very good Signature Pattaya near beach and walking street staff is good and helpful food is good buffet breakfast is good, fruit milk and juice is good. This is very good Signature Pattaya for family stay. Swimming pool area is very need and clean. Very good Signature Pattaya near market as well as. Probably one of the best Signature Pattaya in that locality. Has good spacious rooms and bathrooms with all modern facilities and amenities. The room service menu has a good variety price. The staff is very courteous and helpful. The best part is about its location. Breakfast at Momo Bar was excellent. Prompt and courteous service by stewardess Ink Ink. Breakfast at Momo Cafe was extremely poor. Overall value for money except for breakfast at Momo Cafe. Entire staff is excellent as far as service goes. Excellent place to stay and definitely recommend. Good choice and total value for money. Courtesies staff. Very nice clean and well maintain property with excellent location. Nice Signature Pattaya and near the beach. Well connected to tourist getaways. Lot of eating option. Nice Signature Pattaya, good people, I liked it and will come again. Located in a quiet corner but still near to Walking Street, Central, Beach and Easykart etc. Well informed and courteous staff. All staff understand and speak English. Restaurant Momo was really good even with limited options for Indian food and the best part -they serve you 24 hours. Well recommended for families. The rooms were really good. The staff was really friendly. The Signature Pattaya is situated very close to all attractions in Pattaya. We got a really good deal through Makemytrip and it was a complete value for money stay. Very good Signature Pattaya need and clean location is very well near Pattaya beach and famous Walking street. Hotel staff behavior is good very helpfull. Food quality is good buffet breakfast is very good fruit quality is very good. Overall very good Signature Pattaya for family or couple staying. I like the location of my Signature Pattaya, staff behavior is good, all the facilities are working. Hotel is very clean and tidy. Yes, paying for this Signature Pattaya is value for money. Food is very good. But room size is very small. In all my trip I love the food in this Signature Pattaya. Nice experience very good location near to the walking street and have many Indian restaurants. It was the comfortable stay and the service provided was good. Thank you for the services.